Hong Kong is in many ways like other large cities I’ve visited around the world, and yet like every city, it has its own personality and character. And there was an interesting dichotomy in the super fancy skyscrapers in the financial Central District, and the buildings spread throughout the rest of the city. Pretty much everywhere you go, it is a given that you will be surrounded by very tall buildings. I can only imagine what it would be like to live there all the time. I picture how dark some of the streets might get during very cloudy days. And of course there is the difference in the beauty of the skyline from a distance, and the different sort of beauty when you are smack in the middle of the maze of buildings and they rise up all around you. 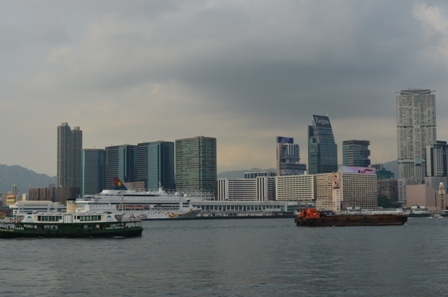 I got plenty of opportunity to see the skylines from a distance on both sides of Victoria Harbor. 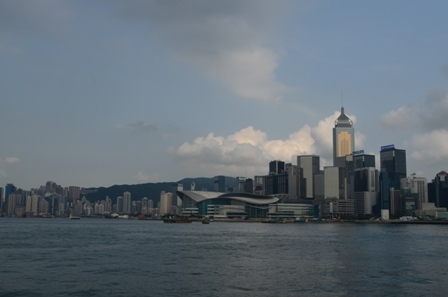 Kowloon and Hong Kong Island are only separated by a approximately five minute ferry ride on The Star Ferry (plus actual subway train lines), so you can easily take in the views from both sides. 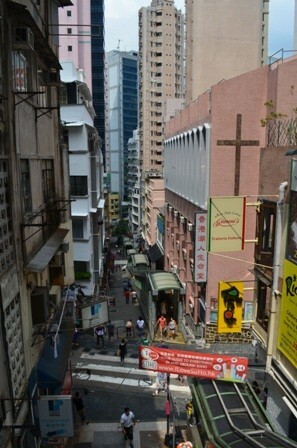 Then you get to the maze of buildings on Hong Kong Island. 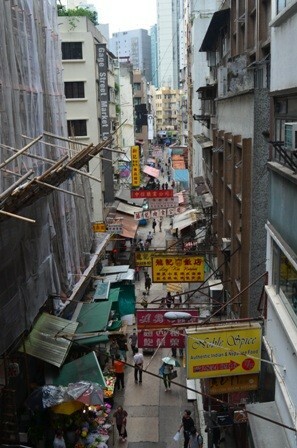 The streets rise up steeply in parts from Central District, to SoHo (south of Hollywood Road), all the way up to Mid-Levels, which is located about halfway up the hill from Central District and The Peak. 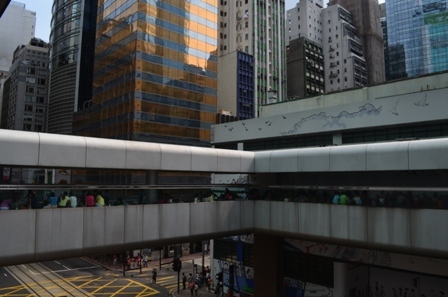 You can walk easily and painlessly from Central to Mid-Levels, through a series of escalators. What’s interesting about these escalators, is that there is only one set. They come down from the Mid-Levels to Central from approximately 0600 am to 1020 am. This is presumably to support the large commute of individuals who live in the Mid-Levels but work in the Central District or beyond. After that, the escalators only ascend for the rest of the day. It’s very easy to take the escalators to Mid-Levels, but keep in mind that you will be descending the stairs on your own (it’s not tremendously difficult). What caught my eye when walking around looking at the architecture is just how colorful some of the buildings are, and how densely packed they were in some areas. The picture below was an interesting capture. 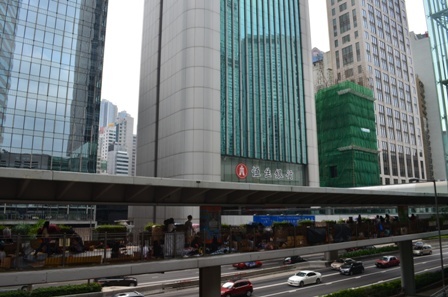 I’m not exactly sure what is going on with the groups of people I saw camped out around town, mainly in places near Hong Kong Station and the like. In both of these pictures you can see large groups of people congregating. Now Hong Kong is constantly filled with large groups of people, but what was interesting here was that these groups were just hanging out. I could never quite figure out what they were doing, but I also never asked either. None of them looked homeless, because they certainly weren’t begging for money, nor were they looking to sell anything. But on many of these walkways, you would see small areas segregated by cardboard and groups (families?) of women and girls (no men) just hanging out, sitting, talking, playing games and enjoying food. I wondered if maybe they were hanging out like this, because they didn’t have air conditioning at home and sitting out like this would get at least some cooling breezes at times. Whatever it was, it is very much part of the culture of the city, because nothing seemed overly amiss about it. 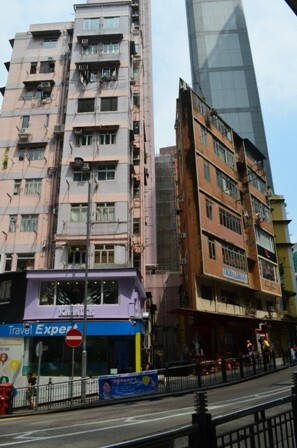 Hong Kong is a city with a LARGE population density. This is definitely not a place to go to get away from it all and be alone. But it is very interesting to compare and contrast the supermodern skyscrapers with the older parts of the city and see how it all meshes together into one community. 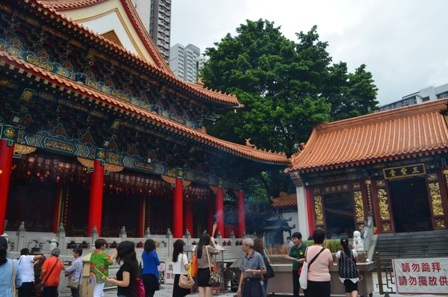 Another interesting trip was to see the Wong Tai Sin temple, a Taoist temple in the far north of Kowloon Peninsula. 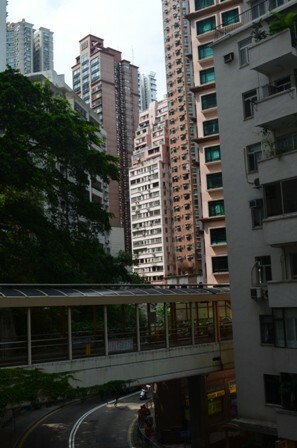 It is easily reached by taking the subway (MTR), green line Kwun Tong Line to the Wong Tai Sin stop. Take exit B2, and you will exit right in the plaza before the temple. 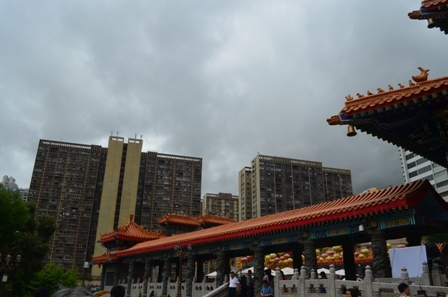 The temple was only built in 1973, but it is very popular. 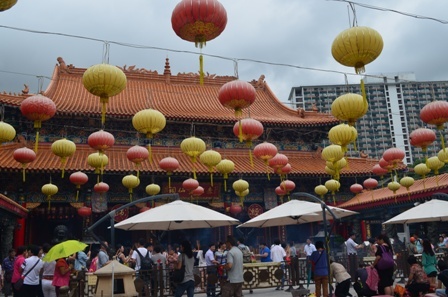 It is very colorful and beautiful and it’s easy to walk around the temple grounds and see pictures of all the different gods represented at the temple. 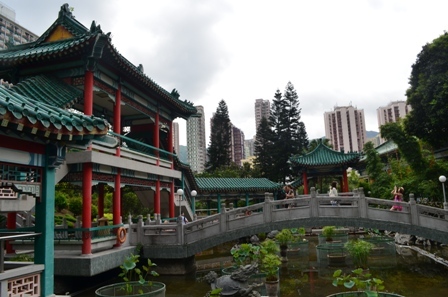 There are even some temple gardens to wander. Admission is free, with a requested donation of whatever you want to pay. 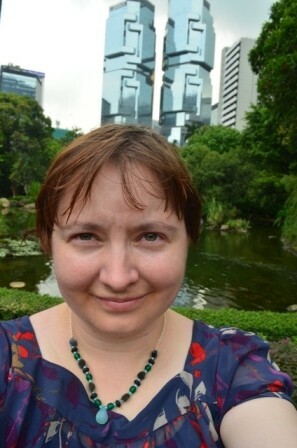 Like everything about urban life, I find it interesting to look out from a religious temple grounds and see the skyscrapers around me. I know I write about it a lot, but I grew up in a TINY town with few people and lots and lots of trees. So these views are very different and very interesting to me. 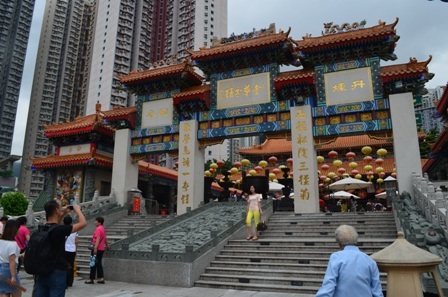 This entry was posted in Travel and tagged architecture, buildings, Central District, crowds, Hong Kong, Kowloon, Mid Levels, skyscrapers, Star Ferry, Taoist, temple, Wong Tai Sin.